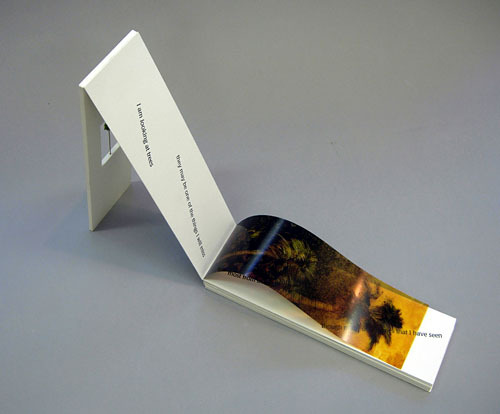 Trees has been made as a limited edition of thirty copies in the spring and summer of 2010. The images of palm trees have been made as monotypes that have been reproduced as high-resolution digital prints on transparent film. 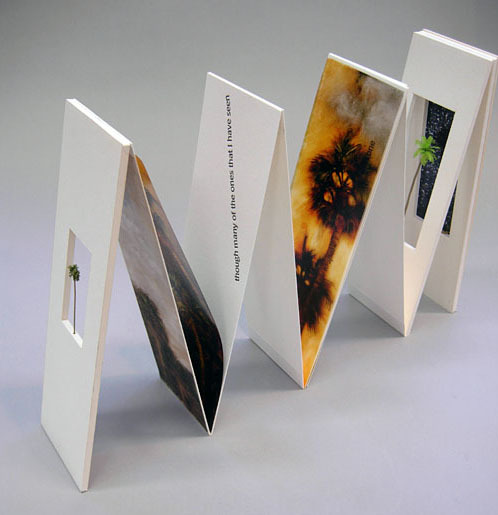 They are hinged between pages of Strathmore 2-ply museum board and acid free foamcore with architectural model trees. The windows in the foamcore were cut at Magnolia Editions,Oakland, CA. The text pages were printed letterpress at JR Press, San Francisco, and the title on the side of the box was foil-stamped by John DeMerritt, Emeryville, California. The typeface is Poppl-Laudatio. Charles Hobson made the monotypes and designed and assembled the edition with the assistance of Alice Shaw. A stop action animation about the making of Trees has been created as a video on Youtube. See the video. Limited Edition of 30 copies. 16 pages. 4 1/4 x 12 x 2 inches. 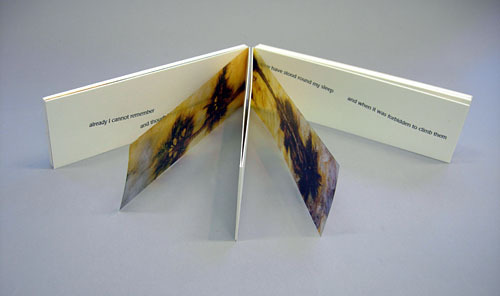 The poem can be read by standing up the first pages and using it to prop each page against it as the pages are turned. When fully "accordioned-out" the book offers a succession of palm trees that can be positioned on different sides of the standing pages, giving a front and back view of the same image. 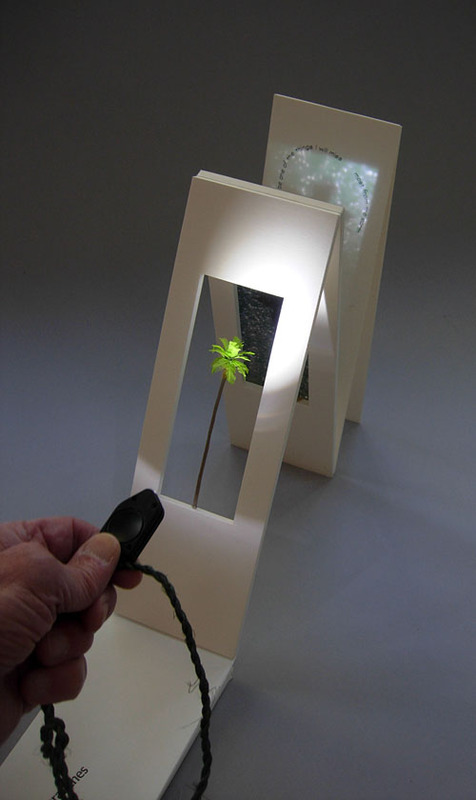 A large architectural model palm tree sits in the window cut in the last panel which is backed by a transparent image of the night sky. The monotypes of palm trees are reproduced as high resolution digital prints on transparency film. 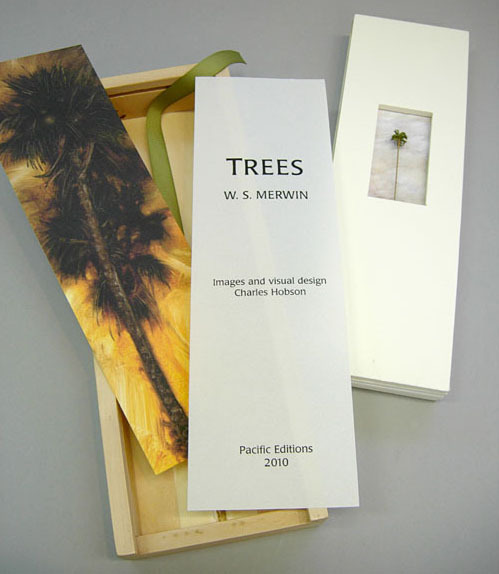 The monotypes lay over the words of he poem which have been set letterpress to follow the shape of the palm tree trunks Ð the words of the poem climbing the trees. When one shines the flashlight on the tree and through the opening at the back of the book the light projects mysterious shadows of trees against the the luminous night sky. There are several ways to orient the book, much as the poem offers subtly varied interpretations. It can be set on its side which presents the type reading from left to right (rather than up anddown) but results in the trees having fallen.